The Ben Franklin Bridge South Walkway Bicycle and Pedestrian Ramp was recently awarded the New Jersey Leading Infrastructure Project Award from the New Jersey Alliance for Action. 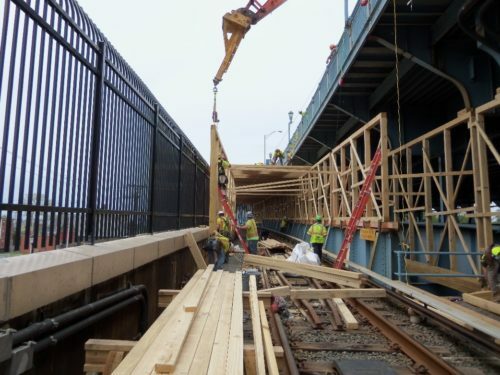 The project, for the Delaware River Port Authority, consists of construction monitoring services on a $7.8 million project to replace a portion of the existing walkway and stairway located on the south side of the Benjamin Franklin Bridge in Camden, NJ with a new ramp approximately 773 feet long. The new bicycle and pedestrian ramp is located above an active PATCO transit line track that runs between Philadelphia, PA, and Camden, NJ. The contractor was also required to design and build a temporary timber shielding system over the track to protect the track during construction activities. The contractor is required to have a Professional Engineer inspect this shielding daily. JMT Construction Management staff is providing construction management/inspection services for the project. The New Jersey Alliance for Action consists of more than 2,500 of New Jersey’s top corporate, labor, professional, academic, and governmental representatives. The Alliance’s mission is to improve New Jersey’s economy through the promotion of capital construction and infrastructure investment. Additionally, the Alliance has been recognized as one of the state’s best associations for networking opportunities.